Joseph Romm, a senior fellow at The Center for American Progress and the editor of climateprogress.org, discusses his latest literary contribution, Language Intelligence: Lessons on Persuasion from Jesus, Shakespeare, Lincoln and Lady Gaga. Romm weighs in on this summer's extreme heat, fires and drought as well as the political and media drought in lack of discussion on climate and energy issues leading up to the November election. Joseph Romm: Why the American Allergy to Global Warming? 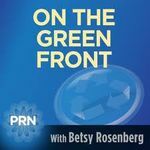 Joseph Romm talks about America's "allergic reaction" to climate change, Solyndra's non-scandal, and Stephen Colbert's hilarious take on global warming reality! Joseph Romm is a senior fellow at The Center for American Progress and the author of Hell Or High Water. He joins Betsy for insights on the latest crop of Republican deny-o-saurs, led by Rick Perry, the Governor of a state that's literally burning up! Tornadoes, flooding, and fires, Oh My! With the death tolls rising from more record-breaking weather events, one can't help but wonder if Americans watching CNN, listening to the radio and reading the news are indeed, finally, connecting the dots between what climate scientists had predicted in terms of more destructive storm events, and what we are now witnessing. I put that question to my favorite climate commentator, Climate Progress blogger Joseph Romm. (dim) in the wake of the triple disaster in Japan. Joseph Romm is a senior Fellow at the Center for American Progress. His blog is Climate Progress. As yet another record-breaking 'blizzaster' grips the east coast AND beyond, Joe and I wonder aloud what it will take to get America to notice Ma Nature is trying to tell us something - it's later than we think! Link to Winston Churchill's The Scaffolding of Rethoric mentioned in the interview.